Many roads lead to the BIOS. A simple keystroke at the right moment, while the system is booting, will get you into the BIOS. If you have a newer Windows computer, maybe one that came with UEFI BIOS, you can enter the BIOS even more easily. To save you the guesswork, we have compiled all the different ways how you can enter the BIOS. Note: Inside the BIOS you can change many basic computer settings, like the boot order, system time and date, or enabled hardware components. That’s why the BIOS (basic input/output system) is also known as “Setup”. Newer computers just boot too fast. Thus newer versions of Windows feature an easier way to access the BIOS, but you first have to boot into Windows. Go to Settings (Windows + I) > Update & Security > Recovery and under Advanced startup click Restart now. Note that this will actually restart your computer. When you restart using advanced startup, you’ll first get to choose your boot options. On the screen that comes up, go to Troubleshoot > Advanced options > UEFI Firmware Settings and click Restart, which will boot straight into your UEFI BIOS from Windows 10. We have previously dedicated an entire article on how to access the BIOS in Windows 8. To summarize: Open the Charms bar, for example by pressing the key combination Windows + C, click the Settings icon, and select Change PC settings in the bottom right. Within PC Settings, navigate to the General tab and click Restart now under the Advanced startup header. In Windows 8.1, the steps are slightly different. Within PC Settings navigate to the Update and Recovery tab, then go to Recovery, and finally click Restart now under Advanced startup. Alternatively, hold the Shift key while you click Restart in the Shut Down menu. The computer will restart into boot options, which include the UEFI BIOS. Like on Windows 10, go to Troubleshoot > Advanced options > UEFI Firmware Settings and click Restart to boot into your BIOS. If you’re still using Windows 7 or an earlier Windows version, you’ll have to employ the traditional way of entering the BIOS, i.e. wait for the right moment and hit the right key. What Is the Right Moment to Enter the BIOS? The right moment is sometime between powering on the computer and before the operating system is launching. The window is so narrow because the BIOS essentially only initializes your hardware, before handing over to the bootloader, which boots the operating system. Once the operating system is starting up, often indicated by the display of the respective logo, you missed the moment. You might see a message that indicates the right moment. It most likely says something like “Press <Del> to Enter Setup”, meaning it also reveals which key to press. In the absence of such a message, the right moment generally is when you see manufacturer logos, prior to the booting of the operating system. And the easiest way to not miss the time when you can enter the BIOS is to press the right key even before you power on the computer and hold it until the BIOS comes up. If that doesn’t work, you’re not pressing the right key or something is broken. As you already gathered, it depends on your hardware. More specifically, it depends on the motherboard the BIOS is located on. 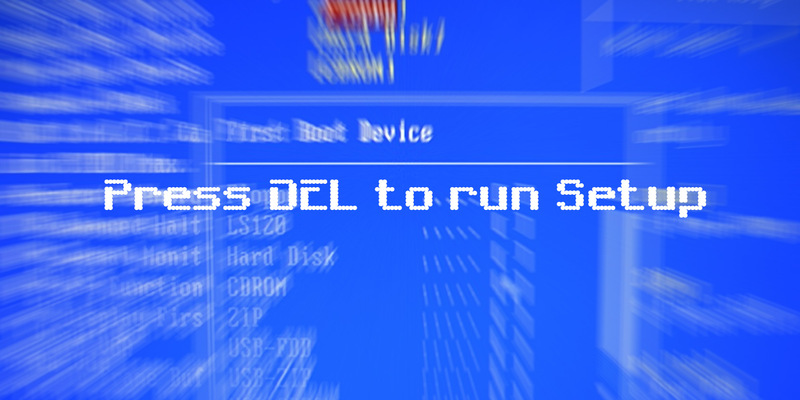 Common keys to enter the BIOS are F1, F2, F10, Delete, Esc, as well as key combinations like Ctrl + Alt + Esc or Ctrl + Alt + Delete, although those are more common on older machines. Also note that a key like F10 might actually launch something else, like the boot menu. The exact key or key combination depends on your computer manufacturer and model. You can proceed with trial and error until you find the right key, press multiple different keys at once and get lucky or consult the list below. The most common keys to enter Setup on Acer hardware are F2 and Delete. On older computers, try F1 or the key combination Ctrl + Alt + Esc. If your computer features an ACER BIOS, you can restore the BIOS to bootable settings by pressing and holding the F10 key. Once you hear two beeps, settings have been restored. As with Acer, the most common key is F2. Depending on your model, it might also be the Delete or Insert key, and less commonly F10. On a newer Dell computer, try the F2 key while you see the Dell logo. Alternatively, try F1, Delete, F12, or even F3. Older models might use Ctrl + Alt + Enter or Delete or Fn + Esc or Fn + F1. Keys most commonly used on HP machines to enter setup include F10 and Esc. On some HP computers F1, F2, F6, or F11 will open the gates to the BIOS. On HP Tablet PCs F10 or F12 will get you into the BIOS. HP has compiled information on its BIOS here. The F1 or F2 key should get you into the BIOS. Older hardware might require the key combination Ctrl + Alt + F3 or Ctrl + Alt + Insert key or Fn + F1. If you have a ThinkPad, consult this Lenovo resource: how to access the BIOS on a ThinkPad. If you know that your computer is using an MSI motherboard, then the key to trigger the BIOS most likely is the Delete key. You might even notice a message saying “Press Del to enter SETUP”. On some MSI motherboard models, the key to access the BIOS will be F2. On a Sony VAIO, F2 or F3 will get you into the BIOS, but you can also try F1. If your VAIO has an ASSIST key, try to press and hold it while you power on the laptop. This also works if your Sony VAIO came with Windows 8. Your best bet is the F2 key. Other candidates include F1 and Esc. On the Toshiba Equium, F12 will enter the BIOS. Toshiba also has more detailed instructions on how to access the BIOS. Unfortunately, there is very little consistency. Neither do computer manufacturers always use the same motherboard manufacturer nor do motherboard manufacturers consistently define the same key for entering the BIOS. If you want a definite answer on which keys to press to enter Setup, you have to search for the exact model of your computer’s motherboard. Did You Manage to Enter Your BIOS? If none of the keys mentioned above work, the issue might be your keyboard or rather the lack of keyboard drivers before the computer boots up. Try another keyboard and/or port. For example, if you’ve been using a USB keyboard, but your PC also has a PS/2 port, try a PS/2 keyboard instead. Once you have access to the BIOS, you might want to reset your BIOS to default settings.